This article will be a little bit unusual. What do I mean? Today, I want to share one skin care advice, which can be useful for those of you, who have oily, mixed, blemished, irritated with some pimples, skin. This advice is related with product, which usually has different purpose, but it's also helpful in these cases. Just, sometimes, you must be inventive and to try, what could be suitable and helpful for your individual special needs (after reading carefully the product ingredients and even, after consultation with dermatologist, if it needs). It's a shaving cream for normal skin. 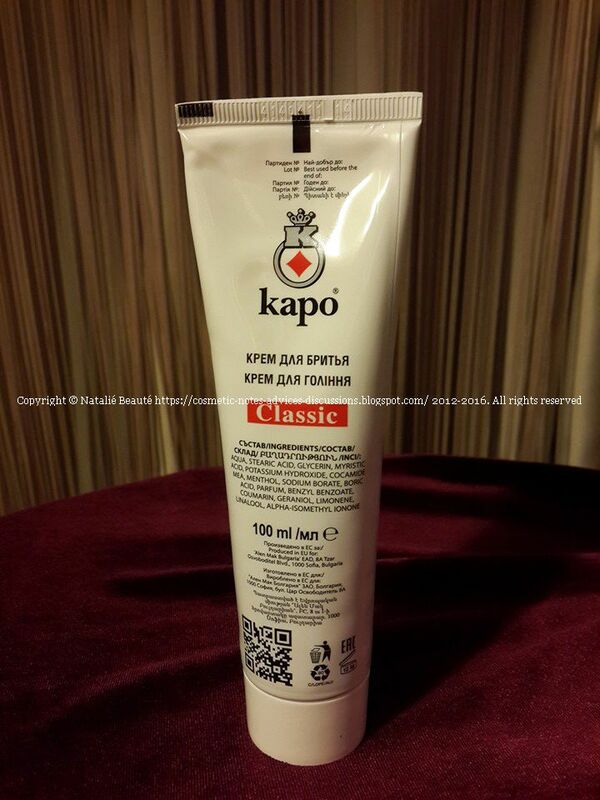 With the decades, "kapo" has been developed in whole products line, for the different skin needs. 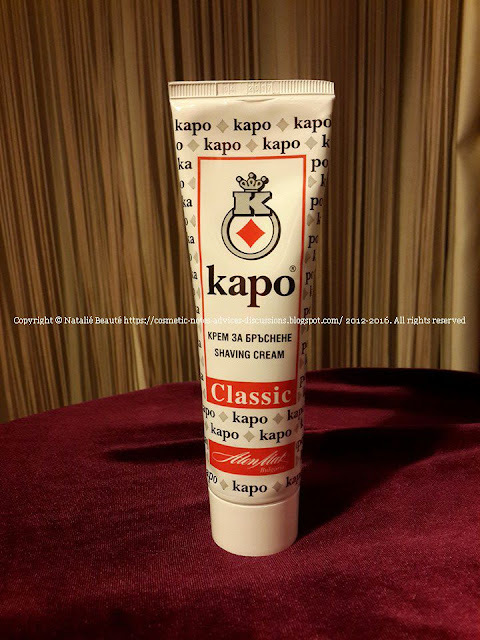 "kapo" - One tradition, handed down by generations, from father to son. 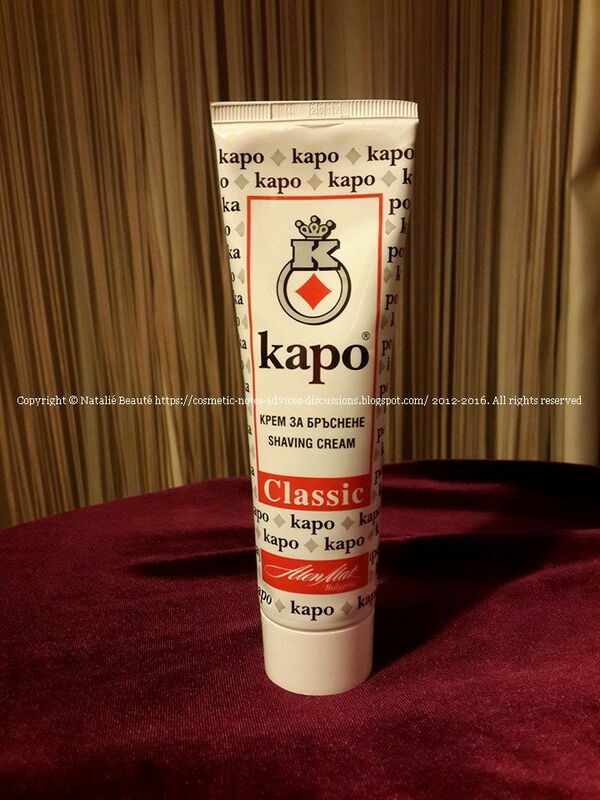 "kapo® brand reveals the secret to a smoother shave and comfortable skin! A sharp razor, a bowl of hot sudsy water and our rich shaving creams. No, not foam! Foaming agents dry out the skin immensely, tear skin, create little cuts and nicks that bleed, and leave skin looking and feeling rough. Reach for one of our shaving creams to experience a closer shave that leaves your face feeling clean, smooth, soft and smelling fantastic. 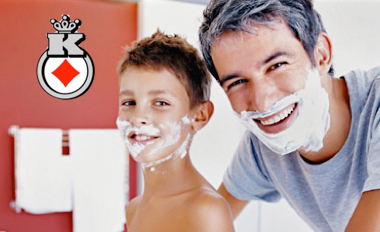 Then trust the after shave creams to hydrate for 24 hours without leaving skin sticky, shiny or greasy. We think you will find this is better than anything else you have ever used. Try it once to believe it. Enjoy it for life." The brand name is: "ALEN MAK" / "АЛЕН МАК" (Red Poppy - WHY?) - Company, with traditions since 1892. 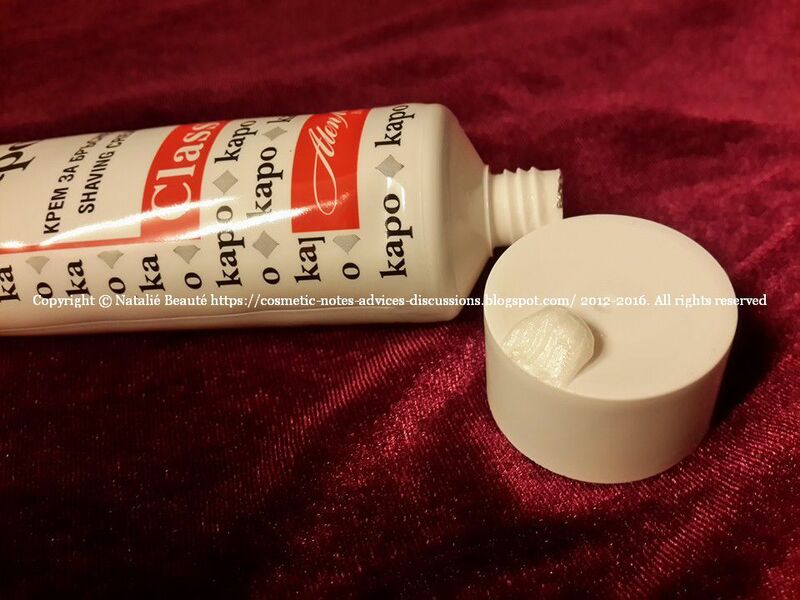 The product "kapo" Classic is thick cream, with shiny pearl pure white color texture, which provides rich airless foam during the process of applying. It has specific scent. - exactly as classic shave product from the past and also, a little bit powdery tone. It smells little bit strange, but the same time is somehow pleasant. The Menthol (Peppermint Oil) has powerful presence in the scent. It softens the hair, soothes the irritations, provides smooth, fast, very easy shave, normalizes the PH balance of the skin. The same time, it acts antiseptic, pain reducing, refreshes the skin. After the procedure, your skin is smooth and very nice on touch. AQUA - main component, which supports the active ingredients to be joined firmly and act normally. The water that we use is ultra purified. STEARIC ACID and MYRISTIC ACID - these are naturally occurring fatty acids, which act as a surfactant (PAV or surfactant) - a compound which reduces the surface tension. Surfactant helps the blade shaving to slide over the skin without hurting it. GLYCERIN - powerful natural moisturizing agent that helps the blade easily glides on the skin and prevents cuts and satiety. It has the ability to draw moisture from the air and helps the skin to retain it, thereby softens and moisturizes, increases elasticity and turgor. Restores natural pH level of the skin and hydrates in depth. 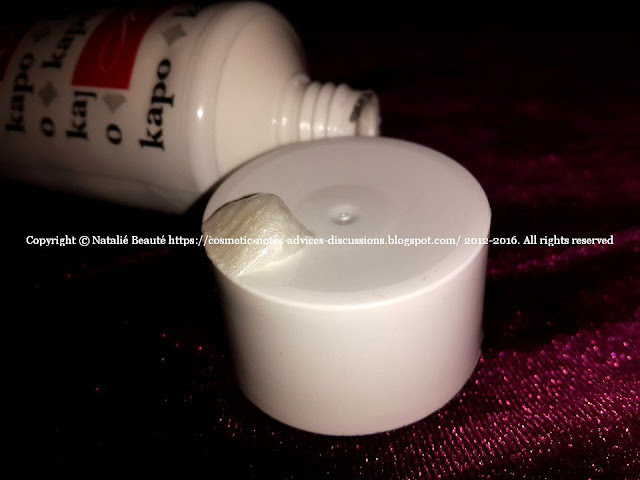 Removes unpleasant feeling tight and dry skin and protects it from harmful influence of environment. COCAMIDE MEA - mixture of fatty acid amides derived from the fatty acids in the coconut oil. It is a powerful natural moisturizing agent. BORIC ACID - weak acid used in the formulation of shaving cream "kapo" because of its antiseptic and anti-inflammatory action. MENTHOL - (Peppermint oil) is a natural ingredient used to soothe irritation of the upper part of the epidermis, to refresh and give it freshness, thanks to the cooling effect. It has an antiseptic effect and contributes to the strength and robustness of the cells of the epidermis. 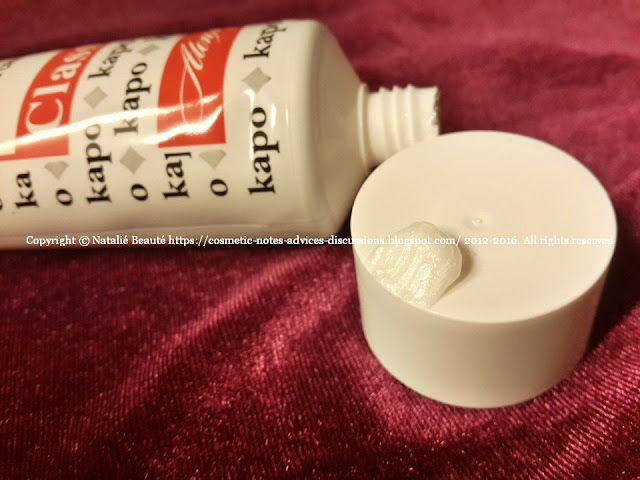 LINALOOL and LIMONENE - are natural extracts from the peel of citrus fruits, which are widely used in the Aromatherapy and contribute to the fresh flavor of cream "kapo". Because of its anti-inflammatory, antiseptic, smoothing, soothing, calming, protecting, moisturizing effect, you can include this product in your skincare routine. Yes, Ladies! You red it correct! 1. Cleansing foam 1-2 times per week in the evenings. Apply it on your skin, make gentle massage, concentrating on the problem areas, mix with little bit water. You can even use small face brush or sponge. After wash out gently. It even cleans the residue from my make up. It leaves the skin velvety smooth, very tender to touch, instantly calmed and transformed! 2. Calming mask on the problem spots-areas, just for a minute maximum (applied on clear skin). It's very good treatment. You can feel the change and the difference in the moment, when you are washing out the product! Because of all its qualities, this product has wonderful effect on the skin! 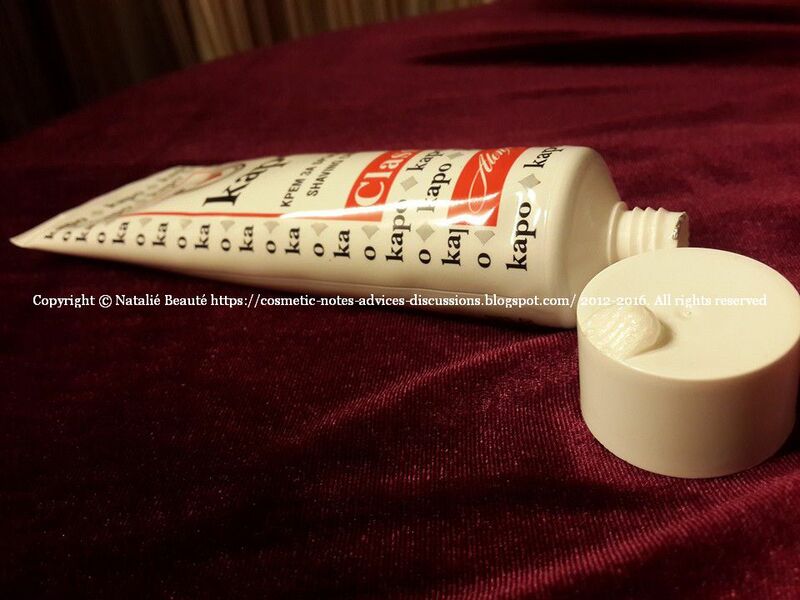 The product is regular tube (in paper box) - 65 ml and 100 ml, sealed with foil, under the cap. The product can be purchased and delivered online worldwide straight, from the company website. High quality product. Experienced and improved with the years. It has wonderful immediately effect on the skin. If you need some product with this effect on your skin, you can dare to try it.